Am considering getting or exchanging my boots for so-called safer ones. I bought some Demonias but the platform heel is really high. I am uncertain to sell them or not. If I do, can you all recommend any boots sold locally, that are between 30-50 SGD? I am not really into Doc Martens / New Rocks anymore. Delica-m is back with another video. Enjoy! The half-Asian band Delica-m has recently released the full video for Counting Stars. Enjoy! 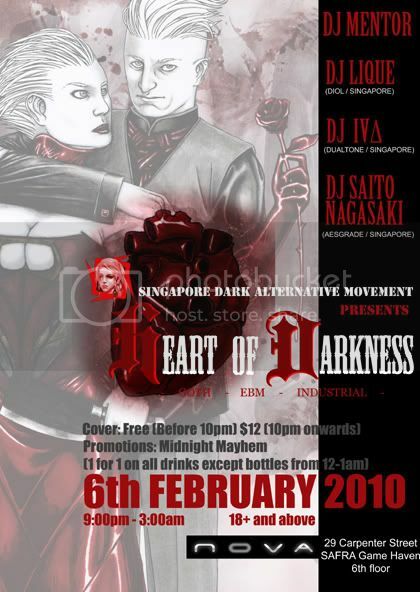 Pick up your sickles and metal pipes, pump your fist in the air and declare your allegiances out loud this Labour Day as the Singapore Dark Alternative Movement unveils the flag inscribed with the words Heart Of Darkness. Rally the people and congregate at SIX as congress will take place from 9pm onwards with DJs Murderfreak and Cosmic Battlefield square off in a musical motion of Industrial against New Wave throughout the night with beats so intense, it will not take long before everyone hits the dancefloor and roaring in approval. 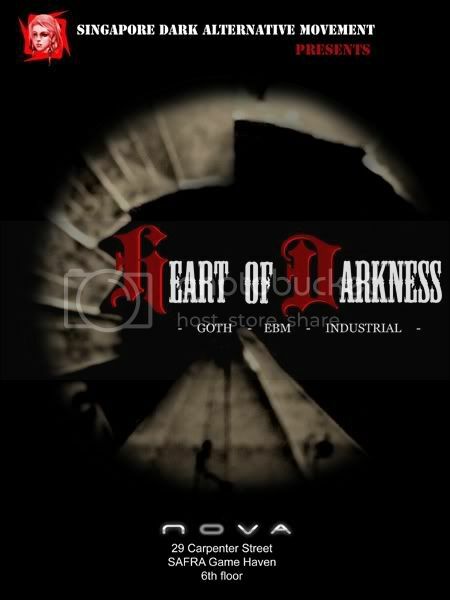 So dress up in your uniform and route march your way to Heart Of Darkness, the watering point of Jack Daniels awaits for you and giving you the fuel to raise your hands in unbridled passion with the only politics that you will ever need, period. 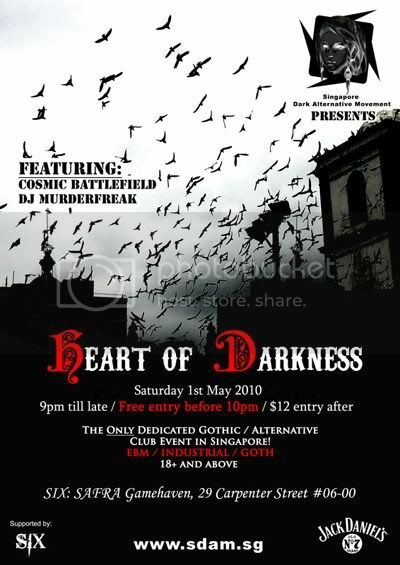 Note: Heart of Darkness will continue on every first saturday of the month* at NOVA in 2010!